Melville International Crime, 9781935554578, 224pp. Murders are a dime a dozen in Margaret Thatcher's London, and when it comes to the brutal killing of a middle-aged alcoholic found dumped outside of town, Scotland Yard has more important cases to deal with. Instead it's a job for the Department of Unexplained Deaths and its head Detective Sergeant. With only a box of cassette-tape diaries as evidence the rogue detective has no chouce but to listen to the haunting voice of the victim for clues to his gruesome end. The first book in Derek Raymond's acclaimed Factory Series is an unflinching yet deeply compassionate portrait of a city plagued by poverty and perversion, and a policeman who may be the only one who cares about the "people who don't matter and who never did." 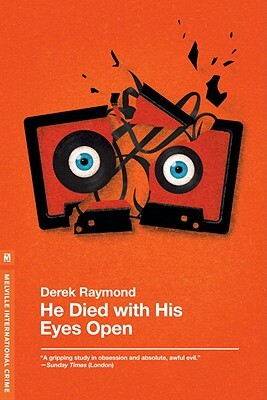 Derek Raymond was the pseudonym of British writer Robert Cook, who was born in London in 1931. The son of a textile magnate, he dropped out of Eton and rejected a life of privilege for a life of adventure. He traveled the world, living in Paris at the Beat Hotel and on New York’s seedy Lower East Side, smuggled artworks into Amsterdam, and spent time in a Spanish prison for publicly making fun of Franco. Finally, he landed back in London, working in the lower echelons of the Kray Brothers’ crime syndicate laundering money, organizing illegal gambling, and setting up insurance scams. He eventually took to writing—first as a pornographer, but then as an increasingly serious novelist, writing about the desperate characters and experiences he’d known in London’s underground. His work culminated in the Factory novels, landmarks that have led many to consider him the founding father of British noir. He died in London in 1993. "Unrelenting existentialist noir—as if the most brutal of crime fictions had been recast by Sartre, Camus, or Ionesco while retaining something of the intimate wise-guy tone of Raymond Chandler and Dashiell Hammett." "It’s one of the darkest and most surrealistically hard-boiled things I’ve ever read. The detective is at least as scary as the murderers he’s chasing." "There remains no finer writing—crime or otherwise —about the state of Britain." —David Peace, author of "The Red Riding Quartet." "No one claiming interest in literature truly written from the edge of human experience, no one wondering at the limits of the crime novel and of literature itself, can overlook these extraordinary books." "The Factory novels are certainly the most viscerally imagined of their kind that I've ever read, or reread multiple times. Derek Raymond wrote in a supposedly escapist genre in a manner that precluded any hope of escape." "I Was Dora Suarez blew me away—beyond hard boiled." "More Chandleresque than Chandler... [Raymond] could write beautifully...and, more importantly, what he is writing about in this novel are nothing less than the important subjects any writer can deal with: mortality and death." "The beautiful, ruthless simplicity of the Factory novels is that Raymond rewrites the basic ethos of the classic detective novel."